BUT JOIN THOUSAND OF OTHER GUITAR PLAYERS IN MY FREE ONLINE COMMUNITY… AND GRAB A POWERPACK OF EXCLUSIVE ‘MEMBERS ONLY’ LESSONS INSTEAD! Here’s What Nobody Ever Tells You About Playing a Great Solo! 0:24 Rhythm is the most important thing to nail when we play a solo. Instead put most of your focus on nailing the groove…instead of thinking so hard about the notes you’re playing! Hammer out the rhythm of your solo phrases and licks with gusto and passion. This will give your phrases rhythmic life and expression. 1:50 I’m going to demo this for you now over a backing track. I’m really trying to ‘lock in’ with the drums and bass, and the groove of the music as a whole – instead of just ‘playing in time’. 2:06 Imagine someone walked into your practice session as you were soloing without backing. Would they hear where the beat was just by listening to you solo? They should be able to! 2:25 So what kinds of results can you expect from doing this? Well, you could see instant change…I’ve seen it in my students many times. 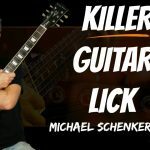 It’s a fast way to improve the sound of your soloing…and you don’t really need to learn anything new – you just play what you already play with more groove!